We headed north to the shelf this morning looking for King Salmon but what we found was a whole lot of warm water. It was 60 degrees down 110 feet at the point. We took one small king before pulling lines and heading out deep to find colder water. We ran southwest and found a break in the 36’s west and 02’s north. We set-up there and started hitting fish. We trolled out to the 39’s hitting fish all the way and then turned back east to go back the break. The surface temp was 59 on the warm side and dropped to 53 on the cold side of the break. We took fish on the east troll through the 38’s but our action slowed after that. When we got back to our starting point the break had dissipated. We spun it back around and finished up in the 37’s . 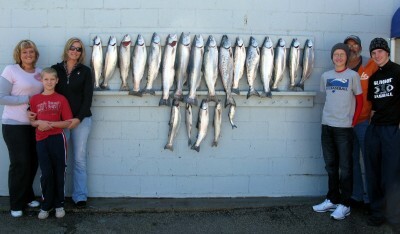 We took two Lakers, a nice 3 year old King , a couple small Cohos and 10 Steelhead. We lost several fish too. We were running the same baits as we did on our last trip out. Today they were picking out the oranges & reds more than the greens & whites. 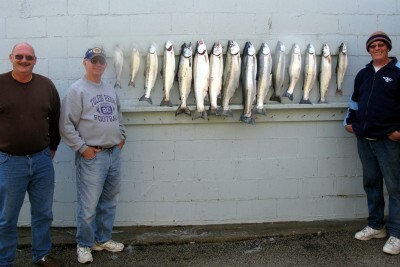 THERE IS A LOT OF GOOD FISHING LEFT BEFORE WE PULL THE BOAT IN MID OCTOBER. GIVE US A CALL TOLL FREE AT 877 456-3474 TO PUT YOURSELF IN THE PICTURE! We started out this morning in the 55’s & 33’s and put it on a west troll. We took a Laker on a 3 color core with a SS Magic Man on the out troll. We turned in the 34’s and took back in. We hit 3 fish on the in troll and took 2 of them. We wern’t marking the fish like we did yesterday so we pulled lines and headed offshore. We set-up in the middle of the 53’s and 44’s west. The surface temp was 53.6 and it was 47.3 at 40 feet. We put it on a 270 and took it out to the 47’s. The water got warmer the further out we went getting as warm as 59 in the 47’s. We turned back east to the 44’s then back out to where we finished in the 46’s. The fishing was fantastic! We hit fish on both the out & in trolls. We took 15 Steelhead and 3 Kings in that water. Our deepest rigger was 45 feet. We were running 3, 5, 7, & 8 color cores and Slide Divers for our high divers and wires for our low divers. Every rod we had out took at least one fish. A Yeck Fireball out 110 on a Slide Diver went 5 times and a regular size Dreamweaver Glow Pearl Spoon with an Orange Ladderback out 55 on a low wire went 4 times. We had a pair SS Lemon Limes on one out down at 35 feet and a Yeck Fire Frog at 40 with a Yeck Firefly free sliding on the other. A Fuzzy Bear SOG with Green Glow Tape was down 45 on a 3 color core down the chute. We had SS Magic Man’s on our 3 colors, a SS Steelie Stomper on one 5 color and a Yeck Fireball on the other 5 color. We had a Yeck Copperhead on a 7 color and a Fuzzy Bear Frozen Veggie on our 8 color core. They all took fish. TODAY WAS OUR LAST SCHEDULED TRIP. WE WILL HAVE THE BOAT IN THRU MID – OCTOBER. IF YOU WANT TO GET IN ON SOME GREAT FALL FISHING GIVE US A CALL AT 877 456-3474 AND BOOK YOUR TRIP TODAY.